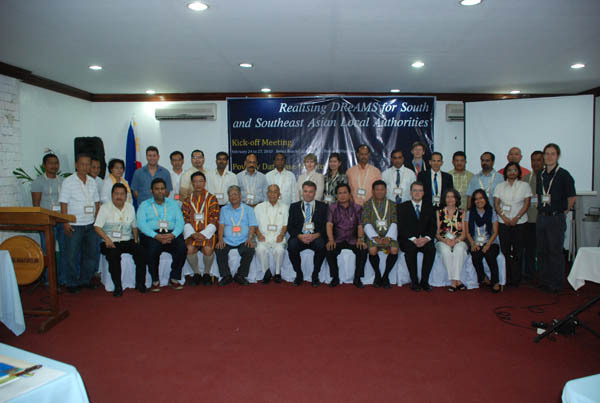 The Realising DReAMS (Development of Resources and Access to Municipal Services) Project for South and Southeast Asian Local Authorities had its kick-off meeting prior to an official launch on February 24-27, 2010 at the Bohol Beach Club in Panglao Island, Bohol, Philippines. The gathering was attended by the representatives from the European Union, the funding partner, along with the project partners from Guntur Municipal Corporation in India, Province of Stung Treng in Cambodia, Thimphu City Corporation in Bhutan, City of Rajshahi in Bangladesh, City of Växjö in Sweden; the officers of the ICLEI secretariats in Europe, South Asia and South East Asia; and the officers and team members from the Province of Bohol, the project’s main beneficiary. The City of Bologna in Italy was not attending the meeting. With barely five years left until the 2015 deadline for the Millennium Development Goals or MDGs, the Realising DReAMS Project is well-timed in assisting local authorities in the above-mentioned cities to improve services and urban governance and thereby take feasible steps towards achieving the MDGs at their localities. The project makes use of two tested and innovative tools, the ecoBUDGET and the Poverty Data-based Monitoring System or PDMS. is a European Union funded initiative with project contract no. ASIE/2009/217461 and administered by the Provincial Government of Bohol, Philippines.